When you buy equipment these days you can never be sure what power connectors you will need. Disregarding the wall outlet types, which vary in different countries and also bypassing the seemingly hundreds of low voltage connectors designed so that the wart from one supplier won’t fit equipment from another, we still have a problem with AC mains connectors. Starting at the domestic end of the market, power inlets can be flat two pin with a notch on each side (Figure-of-Eight) rated at 2.5A. These are IEC-60320 type C7/C8. If the equipment is earthed then it will be an Ace-of-Clubs type plug called type C5/C6. 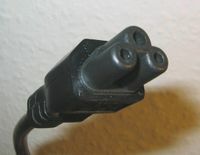 By far the majority of pro-audio and computer equipment has a three pin type commonly called a Euro plug rated at 10A, properly known as type C13/C14. They are common, probably because they are cheap, but do have a habit of falling out if knocked. This is sometimes incorrectly called a kettle plug but that one should have a side notch making it type C15/C16 for high temperature use. They are interchangeable one way round and I have also seen them used in 13A applications (like kettles!). When you get to the big stuff then there is the similar Euro style plug but with horizontal pins rated at 16A called type C19/C20 (or C21/C22 if bevelled). A more recent addition to the choice is the Neutrik NAC3 Powercon for up to 20A. This is a lovely compact design based on their earlier loudspeaker plugs (which we called hose connectors) with a bayonet fit and latch. Grey ones are outlets, blue ones are inlets and they are not interchangeable. At the top end, often seen on lighting gear and main power feeds, are what are known as Commando, Caravan or BS4343 plugs, huge blue things with caps on the sockets. The correct name is IEC-60309 and if they are 43mm diameter then they are 16A, if bigger still then they are 32A. These are industrial specification, water resistant and virtually indestructible. They come in other colours and pin numbers for different voltage, frequency and phases but there is no risk of connecting them up wrongly as they don’t mate. Individual lighting units normally come with the old UK 15A BS 546 round pin plug (you may find some low power ones that have the smaller 5A plug) and it is best to stick with them rather than change them all to the newer 13A square pin because you will find it easier to hire lamps. Another variety, for which I can’t find a picture, is the Wago plug, used on some UPS and power distribution systems. They have three pins in a line and a latch. There are a lot of others, for example US two blade plugs and the old Bulgin plugs which, fortunately, are not used on new equipment but you may find them on antique devices. When you include the panel and inline, male and female, angled and straight and whatever, this is far too many different types. I just wish they could standardise. This entry was posted on 29 May 2007 at 15:04	by Rick	and is filed under ChurchTech, Technical. You can follow any responses to this entry through the RSS 2.0 feed. Both comments and pings are currently closed.